Dotti is a 92 year-old woman who loves to cook sweet treats. For the past 2 years she has been coming into my workplace every Saturday, making me try some of her inventions or her traditional recipes, which have been passed on for generations. Some of these recipes shared have been within her family for 70 years. She told me that she hasn’t shared her recipes with anyone before, so I’m privileged not just to eat them, but to find out how she does it. Dotti doesn’t go by exact measurements or steps; it comes naturally to her, something that I aspire to at her age. Going strong for a 92 year-old, she loves having friends over, insists on making me a cake every time I go over (even though she is cooking something else for me), and has two chickens which she hasn’t named. 1. Mix the flour and a tiny bit of salt. 3. Put the melted butter into the bowl with the flour etc. “You’re going to need to get your hands dirty. As I mix this with my hands so it becomes little crumbs I guess, the flour will turn into little lumps. 6. Roll it flat so that the dough becomes flat. 7. With two hands, gently move the dough from the chopping board to the pan. Lay it over the top. 8. Pat down the dough in the pan slowly, so it doesn’t break. 11. Start grating the lemons and squeezing all the juice out of them into a bowl. 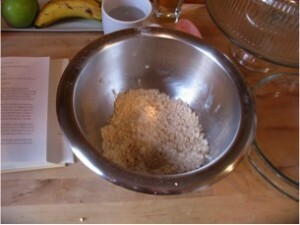 Try and get some of the pulp in the bowl as well. 12. In a saucepan, beat the eggs, the yolks and some sugar together, while over the stove. 13. Pour in the lemon mixture with six or more tablespoons of butter. 14. Wait till the mixture thickens on the stove. 15. Once done, remove that from the stove and let it cool for 5 minutes. 16. Remove the crust from the freezer and put it in the oven on 190 degrees for 20 minutes. 17. 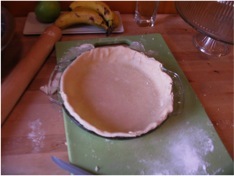 Leave the oven on, but remove the crust so that it can be filled with the lemon mixture. 18. Put that in the oven for about 15 minutes. 19. To make the meringue for the top, beat the egg whites until frothy, then add cream and continue beating. 20. With a beater, mix in some sugar and vanilla extract. 22. Put it in the oven for about 10 to 15 minutes. On a side note from myself, I asked Dotti to do this recipe for me. 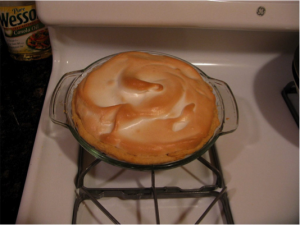 My great-grandmother use to cook lemon meringue pie every Sunday when we went over to visit her. It has hit 10 years of her passing and I have never eaten lemon meringue pie since the last one she made for me. In many ways Dotti reminds me of my great-grandmother, so I thought why not try Dotti’s. It tasted as good as I remember it being 10 years ago.